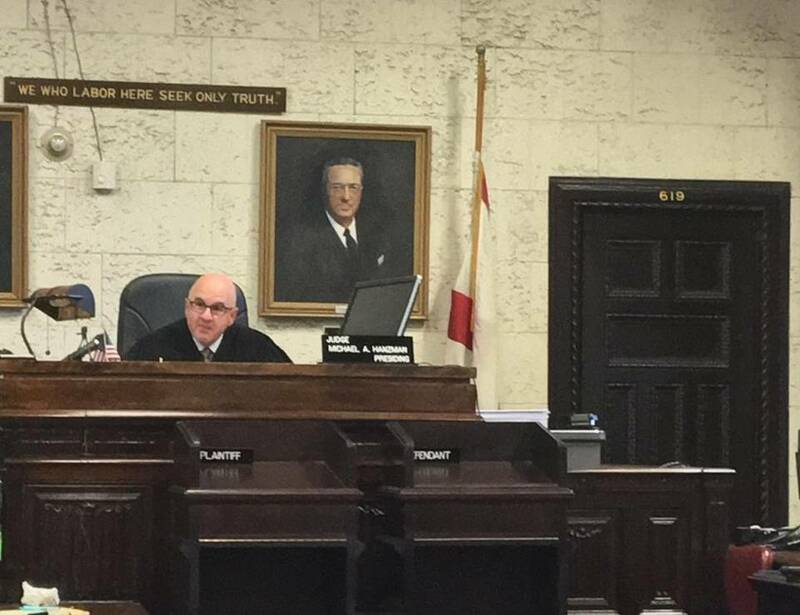 A Miami-Dade judge Thursday dismissed a lawsuit by Miami-Dade Mayor Carlos Gimenez’s reelection opponent over an incorrect date on a qualifying check the mayor filed in June and then replaced three days later after the county’s Elections Department flagged the error. Circuit Court Judge Michael Hanzman wrote that plaintiff Raquel Regalado, a school-board member running for mayor, misread Florida law in claiming Elections was barred from telling Gimenez’s campaign about an $1,800 check filed June 17 with the year written as 2015 instead of 2016. Hanzman said the wrong year was “clearly a scrivener’s error” and that Elections, which Gimenez supervises as mayor, should be “commended and encouraged” for a policy of contacting campaigns about potential problems in filing materials. A top county elections supervisor testified Saturday the agency had also called a tax-district candidate about a flawed date on a qualifying check, and that Regalado herself was contacted about an outdated filing form. Hanzman had already ruled against Regalado earlier in the week, when he declined to issue an injunction disqualifying Gimenez and ordering elections staff not to count any votes for him in the two-candidate race for mayor. That request hinged on the allegation that a bank had returned Gimenez’s original check, which an elections supervisor testified in a deposition Saturday was not the case. Instead, the check stayed with Elections until the replacement check arrived three days later. Three campaign staffers dropped off the new check after 10 p.m. on June 20, hours before the noon qualifying deadline at noon the next day. Regalado suggested the agency opened its doors for the mayor, but supervisor Christina White said in a statement that the office was open late in the nights leading up to the June 21 qualifying deadline for dozens of local races. Regalado’s revised her complaint after Hanzman’s Monday ruling, this time focusing on the charge that the Elections department violated Florida law when it contacted the mayor’s campaign about the flubbed check. County lawyers argued to Hanzman that Florida encourages election staffers to notify candidates when errors are spotted, and that Regalado herself was contacted in June about an outdated campaign-finance form. Gimenez’s lawyers blasted the suit as baseless and aimed at discouraging would-be Gimenez voters in the final two weeks of a campaign that a recent poll showed Regalado losing by more than 20 points. Regalado alleged Gimenez improperly benefited from his role as the boss of Elections in the only county where the elections chief isn’t chosen by voters. J.C. Planas, who represented Gimenez in the suit, called Regalado’s suit “extremely damaging to our democracy” for trying to impose restrictions against elections supervisors assisting candidates seeking to run for office. “The law absolutely requires exactly what the Elections Department did,” he said.